AMMAN — When Mary Jo signed a contract to work as a nanny in Jordan, she was promised a 400JD monthly salary, a weekly day off from work, a mobile phone to call her family in the Philippines and adequate accommodations by her host family. A copy of her contract was given to her as a guarantee that her employers would meet these conditions. However, three months later, Mary Jo arrived at the embassy of the Philippines in Amman claiming to be a victim of domestic abuse. She said she had not been paid during her entire three-month tenure, her passport had been withheld by her employer and she had not been allowed to speak to her family since her arrival in Jordan. Mary Jo, who requested that her real name not be used, said that she carried visible scars on her face from being beaten by members of the family she worked for, and stated her visit to the embassy was the first time she had left the house in months. She said she escaped from a window in the kitchen while trying not to alert her employers. Like Mary Jo, women from countries such as the Philippines, Indonesia, Sri Lanka and Bangladesh come to Jordan to work as domestic workers. They are recruited by agencies that operate under licences issued by Jordan’s Ministry of Labour. Under Jordanian labour laws, migrant workers are given the same rights and protection as local workers; however, reports of abuse or mistreatment remain higher in cases of workers coming to Jordan from other countries, according to organisations that deal with the abuse of domestic workers. According to a report, titled: “How Jordanian laws, officials, employers and recruiters fail abused migrant domestic workers”, issued by Human Rights Watch and Tamkeen Fields For Aid, everyone in the domestic work sector plays a role in failing those who come to Jordan for employment. According to the Ministry of Labour’s website, there are currently 190 domestic migrant worker recruitment agencies in Jordan. Some agencies have a notorious reputation, as workers told The Jordan Times they had been abused by some of the agencies’ owners and employees. Recruitment agencies also run ads on social media and classified websites, which use language associated with “commodities” to describe migrant workers, President of Tamkeen Fields For Aid Linda Kalash previously told The Jordan Times. Phrases such as “discounted maids”, “cash on delivery” and “return or replace” are used in reference to the services agencies provide to potential employers. They use what they call a “bio-data” application, which summarises information about a migrant worker and includes descriptions of their complexion, religion, weight and marital status. They carry a full body picture, and often include remarks such as “she is good and ready for work” or “can decorate, sew and is expert at cleaning”. 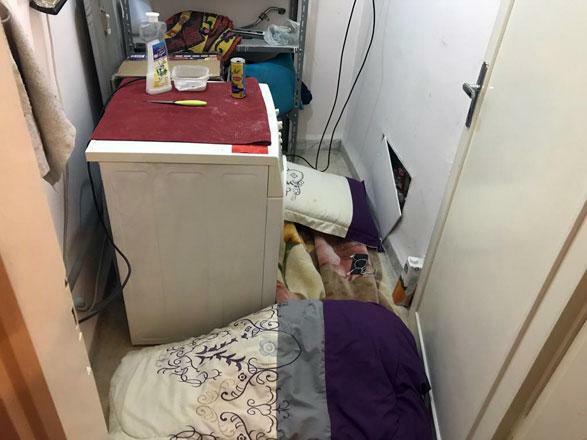 The head of Directorate of Domestic Workers, Hayel Alzaben, said agencies’ claims of an insignificant number of abuse cases do not hold true, adding that his office “on average [receives] 1,200 complaints from migrant workers each year”. According to agencies, there are two reasons why someone would choose to hire a domestic migrant worker in their homes: Either to look after an elderly member of the family, or to look after a home if the husband and wife are both working. This means the worker lives with the family at all times. According to employers who spoke with The Jordan Times, they regularly withhold their employees’ passports, and there are no laws in Jordan which prevent an employer from doing so. Thus, in cases where a worker wishes to switch employers due to any reason, they are unable to do so. Under the contractual agreement between the family and their Sri Lankan employee, the worker is supposed to be provided decent accommodations to sleep in. As part of the process for workers coming into Jordan, migrant workers are also supposed to attend workshops to familiarise them with Jordanian culture. But according to Mukaram Odeh, executive manager of the Jordanian Women’s Union, these seminars “hardly ever take place”. “It is a collective failure on the part of recruitment agencies, as well as the embassies of migrant workers, that these mandatory trainings do not take place, and cross-cultural tensions are created,” she said. Current Jordanian laws require migrant workers to receive sponsorship for their ticket and visa before they can come into the country, and several recruitment agents complained of workers who take advantage of the system to enter the country free of cost. Migrant workers also sometimes violate their visa deadlines, and stay in Jordan illegally to work as “freelance” cleaners, according to the agents. “There are currently over 20,000 undocumented migrant workers who work on a rolling basis, cleaning a home for a particular rate depending upon the number of hours she takes to clean the house. She is paid directly in cash, and thus no taxes reach the government,” the agent told The Jordan Times. “Workers have stayed four, five years after their visa has expired. And when they decide to go home, they simply show up at a police station pleading to be sent back,” the agent said, adding that he has dealt with 15 “runaway” incidents in the past year alone. All the stakeholders who spoke with The Jordan Times agreed the issues surrounding domestic migrant workers needs better governing laws. Agencies currently seek laws from the government protecting them against “runaway” workers. Rights groups seek laws enforcing stricter punishment against the abuse of migrant workers and the workers themselves seek laws enforcing fair treatment and fewer restrictions on their lives. Unanimously, they all seek more action from the Ministry of Labour, which they believe, they told The Jordan Times, can put an end to the mire facing domestic migrant workers. When I was Chief of Mission for the International Organisation for Migration for Jordan and Iraq I received a delegation from the US State Department wishing to talk about ‘human trafficking’. I told them that the issue of domestic workers in all Middle Eastern Countries were of much larger importance, but they were not interested to tackle that question. (That was now more than ten years ago).